If using a single atom to capture high-resolution images of nanoscale material sounds like science fiction, think again. 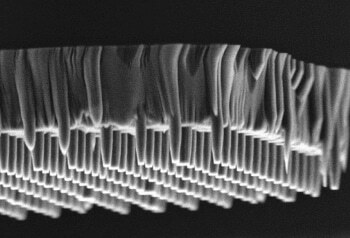 Scanning electron microscope image of a typical diamond cantilever fabricated for magnetometry. That’s exactly what the Quantum Sensing and Imaging Group at UC Santa Barbara has achieved. Members of physicist Ania Jayich’s lab worked for two years to develop a radically new sensor technology capable of nanometer-scale spatial resolution and exquisite sensitivity. Their findings appear in the journal Nature Nanotechnology. Under the microscope, the unique single-spin quantum sensor resembles a toothbrush. Each “bristle” contains a single, solid nanofabricated diamond crystal with a special defect, a nitrogen-vacancy (NV) center, located at the tip. Two adjacent atoms are missing in the diamond’s carbon lattice, and one space has been filled with a nitrogen atom, allowing for the sensing of specific material properties, particularly magnetism. These sensors were manufactured in the clean room of UCSB’s Nanofabrication Facility. Such quantum behavior is often associated with low-temperature environments. However, the group’s specialized quantum instrument operates at room temperature and all the way down to 6 Kelvin (almost minus 450° Fahrenheit), making it very versatile, unique and capable of studying various phases of matter and the associated phase transitions. This research was supported by an Air Force Office of Scientific Research Presidential Early Career Award for Scientists and Engineers award, the Defense Advanced Research Projects Agency’s Quantum-Assisted Sensing and Readout program and the Materials Research Science and Engineering Center program of the National Science Foundation. UCSB co-authors include postdoctoral scholars Matthew Pelliccione, graduate students Alec Jenkins and Preeti Ovarchaiyapong and undergraduate student Christopher Reetz. Additional co-authors are Eve Emmanuelidu and Ni Ni of UCLA.